Valentine's Day is a time to celebrate the sweeter things in life. But some Chicagoans are using it as a time to remind us of the ways, large and small, that we fail to show the love. These three groups are staging protests across the city on Sunday to try and warm our hearts to their causes. 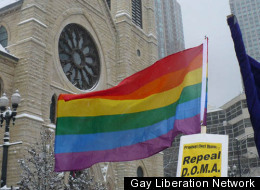 Gay Liberation Network's "Freedom To Marry Day"
The LGBT direct-action network is demanding the Catholic Church honor love of all kinds this Valentine's Day, bringing a protest to the doorstep of Cardinal Francis George of the Chicago Archdiocese. "This is not just about the equal right to marry," GLN co-founder Andy Thayer said. "In Illinois, Cardinal George and his predecessors over the years have worked behind the scenes to vehemently oppose every piece of equal rights legislation for gay people that has ever been proposed, including opposing equal employment rights, equal access to housing, equal access to public accommodations and equal access to adoption." The Catholic Church has a long history of anti-gay policies, describing non-heterosexuals as "evil" and "gravely immoral." "When haters garb themselves in clerical robes, their statements and activities must be exposed," Thayer said. If you want to help Thayer and the LGBT community deliver the message to the Catholic Church, the protest is at Holy Name Cathedral, 735 N. State, Sunday at 10:30a.m..
Republican Scott Tucker, nominee for the 11th District's State House seat, has made the red-light cameras a major issue in his campaign. He told The Expired Meter blog: "I think it's a quality of life issue... it's a tax presented as public safety. It takes money out of the citizens' pockets and puts it into the hands of wasteful government." We'd never thought about it that way, but nobody likes getting those tickets in the mail. And it seems a little Big Brother, doesn't it? Well, the Liberty Restoration Project sure thinks so, and they've organized a nationwide campaign on Facebook to protest the cameras. Take a stand against the cameras at the corner of Addison and Western, from 12 to 3 p.m. on Sunday. "One of the busiest days for the horse-drawn carriage industry is on Valentine's Day," writes Carriage-Free Chicago on its protest's Facebook page. In fact, they remind us, the carriages aren't so romantic for the poor guys who draw them. The protest claims that horses are "forced to work under extreme weather conditions and have insufficient food and shelter," and plus, their faces are pressed against tailpipes day in and day out. Too much to bear? Head to Water Tower Place from 2 and 4 p.m. on Valentine's Day and give some lovebirds a friendly reminder to let horses share the good vibes.